Facility managers are looking for better ways to maintain and improve their facilities. During the recent IFMA Facility Fusion conference I was asked on multiple occasions, “Is there a way that benchmarking can be used to support facility improvements, especially in the maintenance area?” Well the short answer is, “Yes there is!” Quite a few of the people that stop by our booth seem to be having trouble justifying what seems to be really straightforward improvements. Benchmarking can help with that. Most FMs are familiar with benchmarking concepts. You enter your cost data, occupancy, and areas. Figure 1 summarizes an example of maintenance cost data. From this data any benchmarking system should be able to provide a normalized cost comparison. This kind of benchmarking system shows where you stand compare to your peers as in the example below. The buildings shown in Figure 2 are filtered by the gross area of all buildings greater than 600,000 ft.2 and the type of facility, “Office-type”—this makes the comparison similar to the size and type of our building. Our building is in the top end of the fourth quartile with a maintenance cost of $3.01 per square foot. There clearly is a lot of room for improvement! 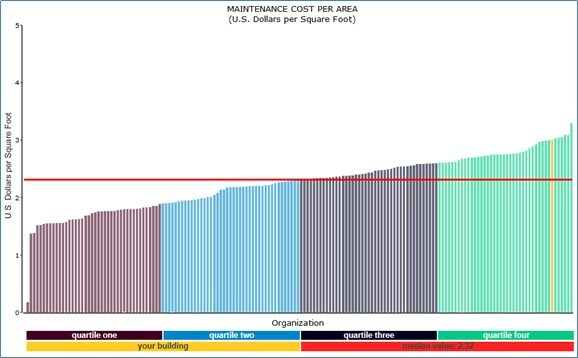 Figure 2 —Annual Maintenance Costs per Area. Our building is in yellow at the beginning of the fourth quartile. A good benchmarking tool will provide you with the information to answer that question. Figure 3 identifies the first five best practices from FM BENCHMARKING’s maintenance best practices. To improve your performance you need to know what to change in your facility. A way to do that is to compare what others are doing to your practices. Note in Figure 3 that the first five best practices are not being applied at all in our facility, yet even two-thirds of the buildings in our low-ranking fourth quartile have applied them. There’s obviously a lot of room for improvement in our facility, and implementing these first five best practices would be a good way to start. Carefully analyze which best practices would have the highest return on investment and the highest benefit to reducing your maintenance costs. By applying these, you are sure to improve your performance. For a little bit of your time you will receive quite a bit of valuable feedback on which best practices would have the most benefit to improving your performance.